I think you either love it or hate it. Is there a middle ground with this much loved/hated vegetable? If you hate it, find something else to substitute it. If you love it…well tuck in please. 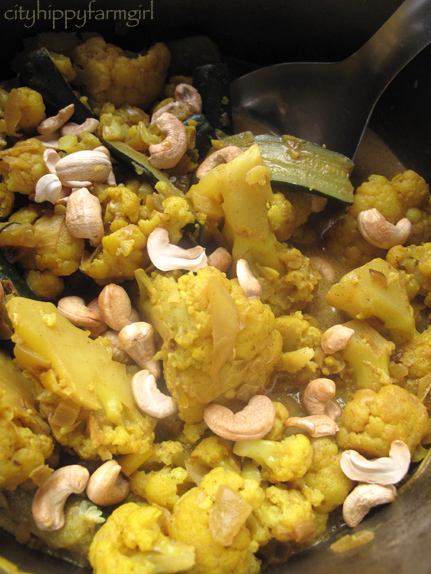 This entry was posted in Making, Creating + Frugal Living and tagged cashews, cauliflower, cheap meals, curry, easy cooking, Frugal Living, sri lankan cuisine by cityhippyfarmgirl. Bookmark the permalink. Unfortunately I’m in the “hate it” camp – but I can manage to eat cauliflower if covered in cheese a la gratin! (I could eat anything covered in cheese)! Ah , thankyou….. my friday night tea is saved because of you. I just couldn’t face cooking …but I have all of the above ingredients and I am ready to go!! I love it. Katherine hates it. We NEVER have it. Once her friend was going out of town and loaded up a bag of groceries for us that would go bad. She asked Katherine if she liked cauliflower. Katherine said no. The friend still put it in. Katherine was miffed, but what do you say to free groceries. They’re not friends anymore. I think it was the cauliflower. See cauliflower is powerful stuff, it divides and conquers…even is the cause of a friend loss here and there. Never underestimate the power of the cauli. Yay, another Friday night dinner save thanks to you! I love cauliflower. I need to try this. I love it, but only when it’s flavoured or seasoned – and never raw. Clearly, this dish ticks all the boxes. I love the short ingredient list too. Looks lovely, and good for my fella, I’m always on the lookout for tasty, easy veggie recipes. Don’t think the kids would try, maybe eldest, will try. Put me in the love it category please. Nice pic as usual – the humble cauli looks really appetizing which can be somewhat hard to achieve in a photo. The turmeric surely helps. I was just reading your ‘about me’. I hadn’t read it before – usually don’t read anything on side views. How utterly quaint! Such a nice intro and I love all the things you listed. I sincerely hope one day the ‘farm aspirations’ come true for you. I know for me they are just around the corner. Have a great weekend! Thanks Mariana. I hope they come true one day too. I’m not a fan of cauliflower, but this makes it seem appetizing – no small feat! 🙂 Poor old cauliflower. It’s been an up hill battle from the start. Need to go get some! Now aren’t you just brilliant. I have a lovely looking cauli and was thinking curry and I have some coconut milk to use up, but hadn’t got any further. I’m bookmarking this one right now and know what we’re having for supper tomorrow. I’ve even got some cashews – yippee! Although in past years I’ve always been extradited to the outside kitchen due to the pungent cooking aroma’s of cooking cauliflower…I still love it! Be it boiled, crumbed or currified….I can’t resist! It’s a winner! I love cauliflower. I’d eat it however it’s cooked really, and in curry just sounds awesome! I used to hate it but now I love it. One of my faves is cauliflower soup because in summer it can be made a bit lighter and served chilled and it is so heartwarming when served hot in winter too. I’ve just eaten the curry for supper. I think it was probably really good, but I foolishly had a stuffed chilli with it and am now in need of a fire engine! Seriously, it was a great use of a cauli I had and the last of our courgettes and an open tin of coconut milk that needed using up, so thank you for the inspiration. You have Frugal Friday? I have Skinflint Sunday! I’ll save this recipe. We’ve eaten the last of our caulies as we move into summer.